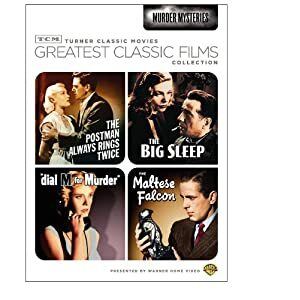 For Christmas I bought a TCM collection that contains four suspense movies. The other night I watched Dial M for Murder, an Alfred Hitchcock flick I'd never seen, but very much enjoyed. An ex-tennis pro executes a plot to kill his wife. When things go horribly wrong, he shifts to plan B. The plot is brilliant, as the husband plots the perfect murder. I love that the boyfriend is a crime novelist, who tries to weave a tale of how the husband could have plotted the murder. Grace Kelly plays the wife while Ray Milland plays the husband. I haven't seen him in anything else, but very much liked his screen presence. All in all this is a great movie when you want something that has twists and not a hint of romance. It's definitely one I'll watch again. If you've seen Dial M for Murder, what did you think? Dial M for Murder is one of my favorite Hitchcock films, so happy you enjoyed it! I love Hitchcock movies (except for Psycho). Dial M is definitely one of my favorites. Watch the Grace Kelly closely in the movie...this is so brilliant... In the opening scene where she's kissing her hubby, Ray Milland (who was in Love Story and many other movies, too), she's wearing white. When the boyfriend comes, she's in that red cocktail dress...then as the movie progresses, she's in gray and drab brown. Just her wardrobe and hair alone give a sense of what she's going through. Great visual stuff that we don't even realize when we first watch it.